Greetings one, and greetings all. We hope you are well and enjoying the festival season! We're certainly having the right weather for it! So...what have we been up to since the last update? Well...we are well and truly working on our new album at the moment! We've had a couple of sessions in the studio so far, and have been discussing artwork with artists and photographers, and trying to decide what to call it. It's going to be a really great album, we reckon, and we're very excited about it! We're working with Jess' brother, Steve, who worked on the first album, and also on the live tracks on Of Maids and Mariners, and we're incorporating things that we learned from working with Stu and The Company of Players, so it's going to be a really interesting process. We've also been working very closely with the fantastic team at Solid Entertainments (who help run the Great British Folk Festival, amongst others) and are involved in a string of excellent one day festivals across the country, that the team there have organised. We played the inaugural Lincoln Folk Festival last weekend, and had an absolute blast. The line up included Julie Felix, Lindisfarne and Gilmore and Roberts, and stays pretty much the same from festival to festival, so we're really looking forward to catching up with them all again at the next one. Which is in Harpenden, local to us. All the details can be found on our calendar page, but, if you want to buy tickets, we are selling some ourselves. If you pick them up from us at a gig, you get them at a special discounted price! We will have them at all our gigs between now and the festival date, so if you manage to catch us, do come and grab one off us. 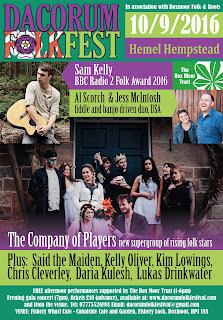 We're also playing at The South Yorkshire Folk Festival in September. The Company of Players is bubbling away nicely. We're just about to send out the last of our pledge goodies, so massive thanks to everyone who supported our campaign. We absolutely smashed our target, and can use it to fund our album, which will be recorded in September. If you are still waiting for goodies from the pledge campaign, they are on their way, so please be patient. September is looking like a busy one for the Players. We have the Looe Music Festival on the 23-25 and, newly booked, the Dacorum Festival on the 10th. September (see flyer below) and in between them, we'll be in the studio!! The Players are touring next April, and dates are trickling through, so keep an eye on all our social medias to keep up with that. We also have a new website (not quite finsished, but close) Thecompanyofplayers.co.uk which will have all the details you need! So, the coming few months promise to be incredibly busy and incredibly exciting! As always, all our gig details are on our calendar page, plus Facebook and Twitter.